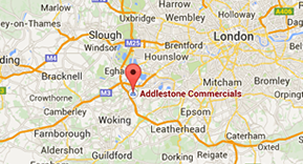 Addlestone Commercials is a family run business that prides itself on a warm greeting and friendly customer service. We sell pre-owned commercial vehicles of all makes, models & types, and hold approximately 70 to 100 vehicles in stock at any one time. We were established in 1974 by Derek Willis at our current premises in Surrey, in the South of England close to London. We are conveniently located a short drive from J11 of the M25 motorway, and close to Heathrow & Gatwick airports. Our main sales premises is a ½ acre site comprising of a two storey office building, modern vehicle preparation workshops and space for vehicle storage. We also have a further two acre site, located a short drive from our sales premises, which we use as an overflow & storage facility, and for vehicle loading & vehicle modifications. Over the years Derek has worked with his father Bert Willis and his brothers Kenny & Roy Willis, and he is currently running the business with his son-in-law Glenn Seery. Our flexible team of professionals are always on-hand to try their very best to fulfil all our customer requests. We employ our own delivery & collection drivers meaning the majority of vehicles have a reliable “road test” before being advertised for sale. We handle all aspects of our business in-house, including advertising, administration, accounts, vehicle repairs, MOT’s, vehicle preparation work, shipping arrangements etc… We also have a modern IT infrastructure that allows us to respond quickly to customer requests and work beyond our normal hours of business. Over the years we have made it a priority to build strong relationships with our tried & trusted suppliers, to make sure the vehicles we stock are some of the very best used commercial vehicles available. We are proud to be one of the only commercial dealers offering customers their choice of payment in $US Dollars or €Euros, as well as £GBP Sterling. You can view an approximate price in your chosen currency when viewing any vehicle on our website, just look for your currency icon below a vehicle’s price. We can also provide safe & secure storage of your vehicle/s at low rates, even if you did not purchase your vehicle/s from us. Please call us to discuss your requirements. No matter where in the world you are, whether you're a single person looking for a truck for your family, or a company looking to add to a fleet, Addlestone Commercials are ready & willing to make your next commercial truck purchase as smooth as possible!